Clients for whom the delivery time is not critical can choose to use the twenty feet container shipping services. To be fully aware of the conditions of shipping goods by sea in 20ft containers, it is worth getting to known the standard types, dimensions, design, top makes, and security control methods of the transport units of this type. The originator of ​​the mass use of shipping containers in the sea transport was Malcolm McLean. The entrepreneur, who had run successfully for 20 years a road transport company, decided to sell it in 1955. The whole proceed from the sale McLean invested in buying a tank vessel which was then converted to a ship that could transport 20ft containers to Australia from UK. Changing the characteristics of the ship carrying liquids (tanker) to transporting 20 feet shipping containers gave rise to the revolutionary changes in the sea transport in terms of the packaging used. The increasing use of 20 foot metal containers contributed to determining their definition by the ISO technical committee. special equipment to provide mechanized handling - especially easy movement from one mode of transport the another. The capacity of a ISO container must not be less than 1 m3. The container designed for sea shipping is a specific type of container that conforms to ISO standards and can be transported on ships as well as on removal vehicles, lorries and by rail (in this definition it is clear imprint of ideas of McLean). A standard 20ft shipping container design is based on a steel frame, which consists of four corner posts and four longitudinal and transverse beams. Which make the base for the floor and the roof. What are the dimensions of a 20 ft shipping container? The basic unit of measure of the twenty foot container is its overall external length set at 20' (20 feet, where 1 foot = 304.80 mm = 0.304 m). The current standard unit is TEU (twenty-feet equivalent unit). In terms of the size of containers they are divided into: small (maximum gross weight up to 2500 kg), medium (greater than 2500 kg and less than 10000 kg) and large (over 10000 kg). In the sea shipping industry the most commonly used containers belong to the series 1 in accordance with ISO norms. Read more about shipping container. Among this group are very often used: 1C-type container with dimensions (width x height x length) 8 'x 8' x 20 'and a maximum gross weight of 24000 kg and container type 1A measuring 8' x 8 'x 40' and a maximum gross weight of 30480 kg. Use of the above-mentioned container is universal. Besides there is a number of individual boxes with a specific use (refrigerated containers, open top containers, tank containers (tanks) and many others). The most common method, and at the same time the cheapest one, of shipping furniture is the sea freight. 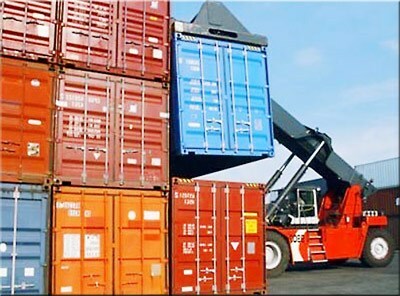 All goods transported by sea are shipped in specially designed 20 ft containers. You may put your couch, double bed, tables, chest of drawers, cot, car seats and other items into smaller plastic or wooden boxes but in the end all will end up in a 20 ft shipping container which travel on a huge vessels owned by international shipping lines. 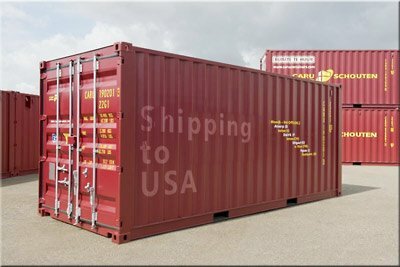 What's the average cost of shipping a 20ft container to United States? If you are moving from the UK let's say shipping from London to New York you can assume it will cost you about £4,500. The prices may vary. It is advisable to get as many shipping quotes as possible and then compare the rates and choose the best service offered. The price for shipping a sole 20 foot container from United kingdom have fallen down a bit in July 2013. Get in touch with us and get the best deal available on the market. If you do not require to ship a full 20 ft container we provide a groupage shipping also called shared or part twenty foot container service.